I’m sure by now you’ve heard that swimming is one of the best workouts you can do for your entire body. You can burn hundreds of calories in just 1 hour. But what if you don’t have an hour to spare? If we’re being real here, we all know life is jam packed with priorities, obligations, work, family, friends, etc. It’s often hard to even find 10 minutes to relax by yourself! But there are speed swim workouts you can do in 15 minutes or less! Let’s look at some ways you can pack an hours’ worth of swimming into just 15 minutes. A sprint swim workout is much like runners do when they sprint in intervals. 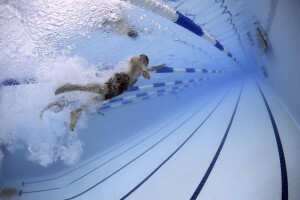 You are essentially sprinting (while swimming) in intervals. You push yourself to swim your hardest. This helps you burn more calories in less time. The first thing to understand about sprint training is that there is always a long recovery period between repetitions, sets and/or workouts. Sprinting, while short in duration, takes a heavy toll on the body. To see all the positive effects, the athlete needs to accompany these sets and workouts with the requisite amount of rest and recovery. The simplest way to use sprint training to gain speed over any distance is to use alactate training. These sets are extremely short in duration (10-12 seconds per repetition, 5-10 minutes for the entire set). These sets can be used to wake the body up for a sprint set, or at the end of a low-intensity endurance practice to work turnover and power. There are plenty of benefits to doing a short speed swim workout, as opposed to the traditional 45-60 minute workout. It actually helps your body recover faster, which allows you to have more energy the next day. Interval sets are designed to allow the swimmer time to rest and recover after each individual swim within a particular set. This in turn, benefits in three ways: 1. The added rest and recover helps build endurance.2. 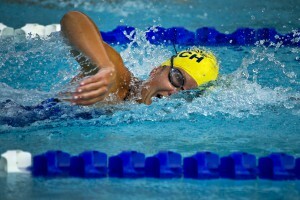 The added rest and recovery allows the swimmer to maintain proper stroke technique and form by remaining fresh throughout the set. 3. The added rest and recovery allows the swimmer to challenge himself/herself by increasing the effort during a set without becoming too fatigued. Before you hop in the pool for your 15 minute speed swim workout, do not forget to grab your Underwater Audio Waterproof iPod filled to the brim with your favorite songs to get you through your intense workout! What is a workout without music anyways? !